A chocolate lovers dream: a rich, moist chocolate base with our delicious crumbs on top. Hahn’s Old-Fashioned Cake Company, Inc. may use an old family recipe for its crumb cakes, but there is nothing old-fashioned about their online delivery services. For those thoughtful folks on-the-go who want to send a special gift to family and friends, locally or across the country, Hahn’s bakers offer the best of products and services. One choice offering is the Chocolate Crumb Cake that will delight the palate of any chocolate connoisseur. Hahn’s bakers prepare a decadent, moist chocolate cake base and top it with large, buttery crumbs that are a dessert on their own. The Hahn’s Chocolate Crumb Cake can be served as a delectable after-dinner treat with any flavor of ice-cream on the side or solo as a snack with a glass of ice-cold milk or cup of steaming coffee. The Hahn’s yummy Chocolate Crumb Cake is baked daily by expert bakers who use fresh whole eggs to ensure the richness of this Kosher-certified indulgence. Simply put, the Hahn’s Chocolate Crumb Cake is a tray full of mouth-watering decadence. 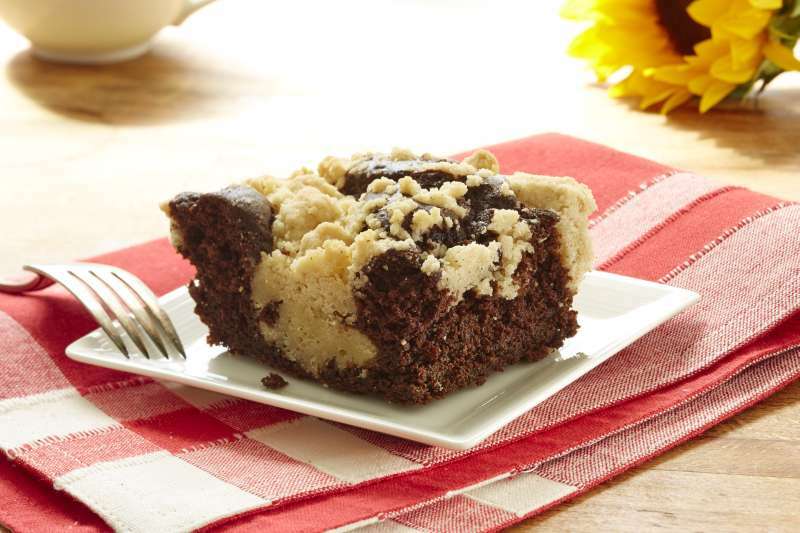 Any chocolate lover will appreciate the gourmet goodness of the Hahn’s Chocolate Crumb Cake. The Hahn’s Chocolate Crumb Cake is ideal. There is nothing like this slice of decadence with its dark chocolate base and rich, extra-large, hand-made crumbs to make them feel special. A perfect add-on to your Chocolate Crumb Cake order is a Hahn’s Bucket of Crumbs or three-pack Can of Crumbs. The Bucket of Crumbs is big enough to sit on the kitchen table for the whole family to enjoy. The Can of Crumbs can be tucked into a purse or backpack for folks who need a quick snack during the day. These unique, easy-to-transport goodies have a six-month shelf life and ship well. Every one of Hahn’s crumb cakes is baked daily and remains fresh for at least fourteen days. Hahn’s offers all of this mouth-watering goodness at competitive prices; plus, those who choose to subscribe to regular shipments of delicious Hahn’s crumb cakes automatically receive a 5 percent discount. Additionally, if you refer a friend who becomes a new customer by ordering from Hahn’s, you receive a 20 percent discount on your next order. Hahn’s Old-Fashioned Cake Company, Inc. makes it easy for you and yours to enjoy our delicious Chocolate Crumb Cake. Simply click the “Order Cakes Online” tab. For added convenience, the Hahn’s website presents a map that gives delivery times as well as a map that displays shipping charges according to your crumb cake’s destination. When you have two or more cakes sent to the same address, you receive $3.00 off the standard shipping price for each cake. What a delicious deal! From Doreen Vazquez of N Bay Shore, New York on 12/26/2018 . Received great compliments on your behalf. The cake was delicious!!!! Thank you!!! From Debra of Waldwick, New Jersey on 12/10/2018 . Great gift idea any time of year, always fresh and delicious! From Rhonda Fleming of Reston, Virginia on 12/26/2017 . Ordered it for my parents when we visited for Christmas. It was a big hit. From Anne Martin of Edgewater, New Jersey on 4/18/2017 . Just as excellent (and a little bit richer) than the plain crumb cake. From Jim of San Jose, California on 12/25/2016 . My daughter-in-law never cared for crumb cake, but she devoured her piece of chocolate crumb cake. She's a Chocoholic and this version of your crumb cake suited her just fine.